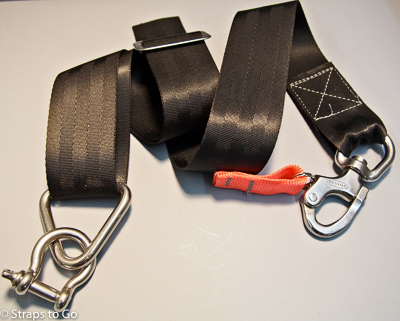 We manufacture tie down straps (lashings) for life raft containers. All of our tie down straps are made to order so you can get exactly what you need. Many straps are made using 2" wide polyester webbing which has excellent strength and abrasion resistance. Additionally it is the best webbing to stand up to the harsh marine environment. Hardware is stainless steel, again to provide maximum service life onboard your vessel. You don't want a tie down system looking like the one above. It is doubtful the raft would perform properly and that is not a good thing. This lashing does show the "V" style that is very common. The other system used is just one piece of webbing going straight across the raft. The strap above is an example of the "straight across" type of lashing, and this happens to be one that we manufactured. This was used on a custom yacht built by Nordlund Boat here in Tacoma. The easiest way for us to make you a new tie down system is to copy what is already being used. If this is for a new installation it will take a bit more effort, we will need to calculate the proper length and style for the strap along with designing in the ability to tension it and have a quick release device, either a pelican hook or snap shackle so you can manually launch your life raft. This is not a job for an on-line ordering system, it takes a bit of time on the phone and possibly sending pictures so we know what you are dealing with. Give Rollie a call at (253) 627-6000 to get the process started. 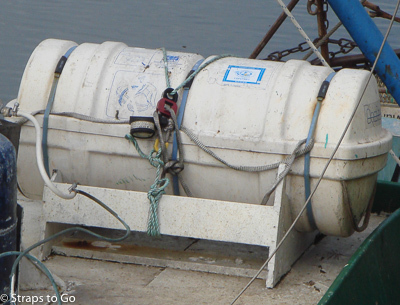 Straps to Go's parent company is Westpac Marine Services, a life raft service facility. When designing and ordering your tie down you will be dealing with individuals who really understand life rafts and how they are supposed to function. We have been doing this since 1984 so there shouldn't be a problem meeting your needs. In addition to the commonly used 2" polyester webbing we also stock urethane coated polyester which provides more grip between the strap and the life raft. The thread we use is SunStop polyester from A&E Thread. It has an advanced UV coating, once again with the marine environment in mind. If you have a Switlik or Winslow raft with stainless steel wire rope tie downs we can also make those.